David Rees Davies works in a variety of media and has exhibited in solo and group shows in UK and Europe, most recently at the Welsh National Eisteddfods in Llandow,Wrexham, Bala and Cardiff; Welsh Artist of the Year 2012; ‘Rhondda Grey?’ at the Rhondda Heritage Centre, South Wales; “The Swear Box, The Falling Pilot & The Avenging Hare” in London 2011; the Jerwood Drawing Prize (UK touring) 2007/9; ‘Nature Morte’ at the Kharkov City Gallery, Ukraine 2009 and “Handshakes & Earthquakes” at the Stanley Picker Gallery, Kingston, London. In July a new series of paintings and drawings were exhibited at the Dinefwr Literary Festival, Carmarthen, West Wales. Works are in the collections of the Scottish Arts Council, Kharkov City Art Gallery, Norwich City Museum, University of East Anglia, Norwich, Kings College, Cambridge. Commissions include Private Eye Magazine, Penguin, Picador, Methuen, Sunday Times, New York Times and Boston Globe. Publisher of limited edition publications: Tasmania Freehand Press, since 1998. 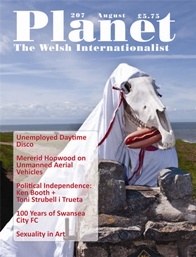 Recent articles include ‘Planet’ Welsh Internationalist Magazine and website. Awarded British Council Bursaries in 1990 to travel and study as artist in residence at the Soviet Union of Artists’ Studios in Moscow, Leningrad, Uzbekistan and in 1998 for a one-man show in Kharkov, Ukraine. Artist in Residence at the University of NSW, Sydney, Australia, 1998. Awarded first prize, Fine Art International Open Print Biennale -‘4th Block Chernobyl Memorial’. Graduated from the Royal College of Art in 1979 and has taught part-time in many of leading UK art schools including, currently, Kingston University, London. Lives and works in East Sussex.